The City Council will decide whether to vote to repeal the ordinance. If it's not repealed, the issue will be placed on the August 2014 ballot. POLL: Should the city's domestic partner benefits law be repealed? A conservative group seeking to overturn a new domestic partner benefits ordinance has already managed to effectively stop enrollment planned for the spring. 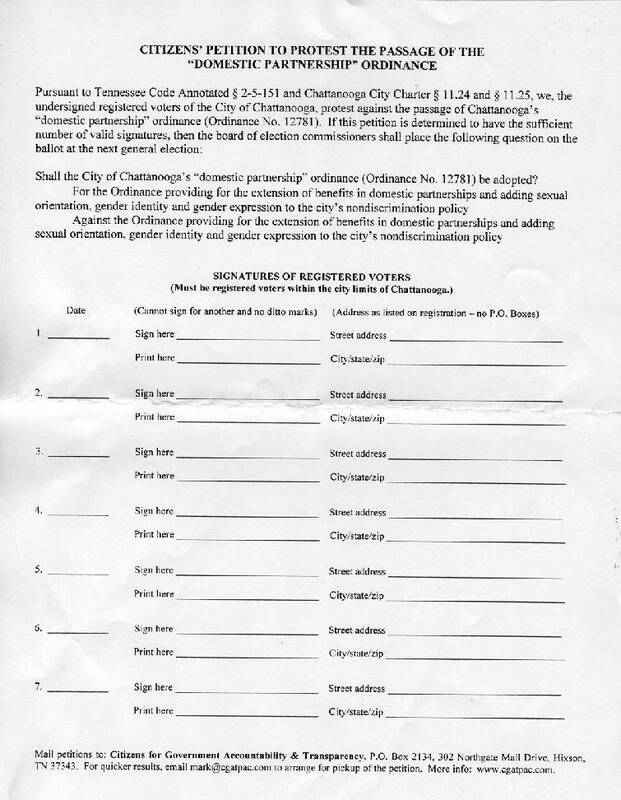 The petition drive mounted by Mark West and other opponents has also set the stage for a potential public vote on the controversial ordinance that made Chattanooga the third city in Tennessee to award benefits to the gay and straight domestic partners of city employees. Hamilton County Election Commission officials stopped counting at noon Tuesday after certifying that the local political action committee Citizens for Government Accountability and Transparency had acquired the minimum 4,500 signatures needed to force the City Council to revisit its November decision or allow the measure to go to referendum. But the total number of signatures collected, West said, was more than 10,000. That's more than half the number of voters that showed up at the polls in March to vote Chattanooga Mayor Andy Berke into office. The overwhelming support, said West, who is also the local tea party leader, shows that the majority of the public is against the ordinance. "That's what this petition for referendum was all about, listening to the people on this very critical issue for our city," West said. "We should remind elected officials they are elected to represent the people first and foremost." But Councilman Chris Anderson, the first openly gay councilman in the state and sponsor of the ordinance, said he believes the signatures reflect a small group of residents. "I think it's a very small minority of people in the city of Chattanooga, many of whom were misled into signing," he said. And if the issue should come down to a referendum? "I feel like we'll be victorious," Anderson said. "The majority of the city is behind this." City Attorney Wade Hinton said the petition suspends the ordinance until the council reviews the measure, which he said should occur in the next month. Employees were going to be allowed to start enrolling their partners in the spring and begin receiving health insurance and other benefits in July. Council Chairman Yusuf Hakeem said he doesn't expect any council members will vote differently upon reconsideration of the ordinance. That means the issue would go to a public vote, likely during Hamilton County's next general election, scheduled for August 2014. On first reading in November, the measure was approved by a 5-4 City Council vote. A week later, with Councilman Larry Grohn absent, a 5-3 vote gave final approval. Several council members who voted for the ordinance said they were still proud of opponents' efforts to use their civil rights and peacefully file a petition. Yet Hakeem questioned the process and said the referendum sets a precedent for residents to push back on other issues that the City Council puts forward. "We are elected to make decisions and ... the referendum process hinders that," he said. "We should not be bullied or cajoled by any one group of people." But West said the referendum is a right of the public to weigh in when their council doesn't act in accordance with their views. "I think Chairman Hakeem is sadly mistaken on that issue," West said. "It reflects he doesn't value the word of the people." During Tuesday night's council meeting, West stacked the signed petitions several feet high on the podium and asked the council to reconsider their decision. Others who signed the petitions spoke as well. "I thank God for these people that responded in the petition drive," local activist Charlie Wysong told the council. "This really is the whole thing a move of common people in Chattanooga." Resident and local activist Chris Brooks told the council that one day residents will be ashamed to have signed this petition just like whites who once made fun of those involved in the sit-ins during the 1960s. Brooks argued that no one from that time would admit now to opposing civil rights. "I know that decades from now those who signed the petition will stand in silence," Brooks said. Contact staff writer Joy Lukachick at 423-757-6659 or jlukachick@timesfreepress.com.